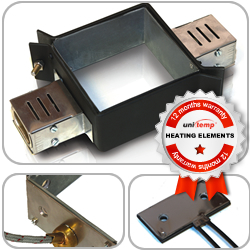 Flat Elements and Box Heaters are primarily used on extruder and blowmoulding heads in the Plastics Industry. Other applications include packaging machines and general heating of containers, pipes and flat metal surfaces. A distinctive feature of these elements is even heat distribution over a large surface area. Construction consists of heating wire, insulated with either Mica-plates or ceramic formers. The elements are usually metal encapsulated for mechanical strength. Mica insulation offers thin construction (approx. 4mm), maximum Watts density of 3.5 W/cm² and operation up to 380°C. For process temperatures in excess of 280°, ceramic insulation is preferred. Ceramic elements are thicker in construction (12mm) but offer a Watts density of 5.5 W/cm² and operating temperature up to 600°C. Generally ceramic elements are more durable than mica elements, thus offsetting the higher price with a longer life expectancy. & covers failure due to defective material or workmanship. Good thermal contact between the element and metal surface to be heated is essential. Due to the large surface area and flat construction, warping of elements will result in air pockets, causing hot spots and possible failure of the element. It is, therefore, important that elements are clamped on tightly and that clamps are retightened once the elements have reached operating temperature. On flat elements a backing plate of at least 2mm thickness and clamping screws at regular intervals are advisable. Elements are susceptible to moisture and should be stored or used in a dry environment. It is recommendable to heat up the elements gently after a prolonged period out of commission. This allows moisture to escape and prevents damage to the elements. Some temperature controllers have a "soft start" feature, but a similar result is achieved by turning the temperature controller down initially.